Back in 2012 Barnes and Noble introduced built-in frontlighting to the ereader world, beating Amazon at its own game—for a few months, anyway Since then, there have been not one but two Kindle Paperwhites, but now B&N is bringing out its follow-up Nook GlowLight. And it almost reclaims the top spot. The latest front-lit e-ink reader from Barnes and Noble. The second Nook ereader to have GlowLight illumination. The one that's not a Kindle. Bookworms. People with a Barnes and Noble in the neighborhood. People who hate ads on their readers but don't want to pay a premium to get rid of 'em. The Nook Simple Touch with GlowLight was baller when it came out, but its design was never really its strong suit. Barnes and Noble apparently understood that, and ditched it almost entirely in favor of a new, white, light look. It's fresh and new, but unfortunately a little… childish. The Nook GlowLight is very light. At 6.2 ounces it's a full ounce lighter than the 7.3 oz Kindle Paperwhite 2013. It's worth noting that neither of those are heavy, but the difference is definitely noticeable. Next to the GlowLight the Kindle Paperwhite feels a little more brickish, though also more sturdy. The GlowLight's bright stark white frame is bordered with a darker gray rubber outline that's ostensibly there to help you get a better grip as well as to protect the GlowLight from any unprotected drops. The Nook survived multiple drops from waist-height unscathed, though it still made a pretty sickening thud when it hit. And if nothing else, the Nook feels safer to drop; I couldn't even bring myself to drop a Paperwhite for comparison because that just feels like asking for trouble. But the downside is that this little bumper makes the GlowLight just a little wider than it would be otherwise, and just slightly too wide to fit into the back pocket of a pair of jeans. That's a huge bummer. The screen inside that slightly awkward body, however, is wonderful. It's grayer than the Paperwhite's—a fact the white body brings into stark relief—but it's also crystal clear, offering slightly (but noticeably!) sharper text than Amazon's flagship reader. It's close. You only really notice side-by-side, and both screens are great for reading, but the Nook still comes out on top. Once the light comes on though, things take a bit of a turn for the worse. The GlowLight's front-lighting is remarkably bright—the brightest we've seen—and it brings that gray screen up to a nice white glow, but it's also uneven. You can clearly see shadows in the top centimeter-ish of the screen. The Kindle Paperwhite, on the other hand puts out a much more even glow. This weird, almost water-damagey-lookin' strangeness is only at the very very top of the screen, so it doesn't get in the way of your words, but it does have a tendency to catch your eye whenever you're back up at the top of a page. It can be a little distracting until you teach yourself to ignore it. But, unlike the light on the Paperwhite—which is perpetually on but can be dimmed down to near nothing—the light on the GlowLight can be turned all the way off with the press of the reader's little 'n' button on the front. And if you tilt the reader down just a little bit, its quintet of front lights will catch you in the face. Luckily, you have to tilt the thing far past any conceivable reading angle before that happens. That's way less of a practical problem, if even a practical problem at all, but it does make the Nook feel like a little bit cheapish on the occasion you see it. And when it comes to storing all your stuff, the Nook boasts twice the storage of the Paperwhite, 4GB (~2,000 books by B&Ns estimate) to the Kindle's 2GB (~1,100 books by Amazon's guess). Great, but even 2GB is ludicrous. And if you manage to fill up 2GB and still want more, you better be headed to space or Antarctica. Otherwise what is wrong with you? When your just plowing through Game of Thrones or checking out some old Goosebumps for kicks, the Nook is a great reader. Its light but wide-set body is well-sized for a full-handed grip, thumb peeking out on one side, fingers on the other. The bezel is also a good width for a pinching with the thumb on the front, fingers on the back. The rubberized outline isn't intrusive, but it doesn't feel like it adds a better grip in any way that's worth getting revved up about. Something that is worth getting revved up about though is no black reset flashes. That's right; the Nook never has to flash black to reset its screen, at least when you are in book mode and only flipping through text. If you hop out to the home screen were there are pictures, the black flashes will return, but inside, say, War and Peace, you can just keep cruising through page after page after page with no reset flash to disrupt you. We blew through some 100 pages, and there was no discernible distortion. That may not see like a huge deal, but you don't notice exactly how obnoxious that black flash was until it's gone for good. On the UI front, the Nook has gotten an update that brings its home screen right in line with that on the Kindle. At a glance they are noticeably similar. Deeper inside though, the Nook packs some recommendation lists that are customized to expand your reading horizons by actual human beings. There is a list called "Pick just for you," which is itself composed of other lists like "The Roaring Twenties" (thanks to The Great Gatsby) or "Reading Your Mind" (thanks to a Malcolm Gladwell book) or what have you, based on what books are already on your Nook. But these lists, unlike Amazon's algorithmic recommendations, are put together in part Barnes and Noble's real, live booksellers, the idea being they can make connections you couldn't. That's a hard claim to validate, but from our brief experience the lists at least seem interesting to browse through. That is, if you don't already have a stack of some four of five dozen books you're already meaning to get to. 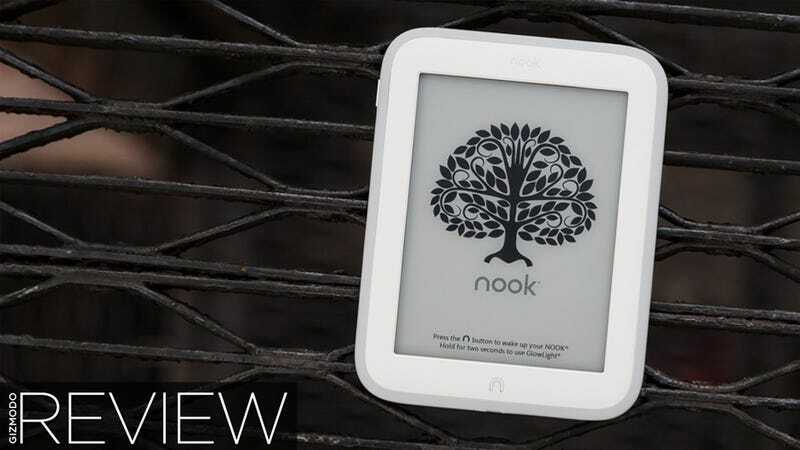 The other big feature that Nook boasts, thanks to its connection to a chain of real book stores, is that you can stop by your local Barnes and Noble, chill out, and read any Nook ebook for free for an hour while connected to the store's Wi-Fi. This isn't a new feature, but it's still cool, and a clever little perk you won't see anywhere outside of a Nook. The Nook has a beautiful screen for a great price. It's only $120, its screen looks better (if grayer) than the Paperwhite's and it comes without ads. Sure the front-light's a little uneven, but it's also the brightest out there. The body around the screen is just… silly. This isn't a Kobo Aura HD-level flub, but the Nook's body feels a little too Fisher-Price to be taken seriously. Other reactions around the office were that the rubber edge makes it seem a little like a teething toy. The whole "for kids" feeling only gets worse if you like to read with a big font for whatever reason. But more than that it's too wide and rubbery to slide into a pocket well. That can be a deal-breaker. Maybe? There are plenty of good reasons to by the Nook GlowLight. It's the same price as the ad-subsidized Kindle Paperwhite except without the ads. It has a slightly better screen. It has the brightest light. It's good crazy storage. It doesn't flash inside books! It's hooked into the Nook/Barnes and Noble ecosystem, which doesn't have the same bells and whistles as the Kindle Store, but it has its own. Also it's bigger. Over 3 million titles, versus Amazon's "over 1 million." You won't want for titles. But there are a few good reasons to not buy the GlowLight too. It looks kinda silly but worse, it won't fit nicely in your pocket. If you don't let vanity and the size of your pockets control your day-to-day life, the new Nook GlowLight is a solid choice. Maybe you don't even think it looks that silly! But the lack of ads and slightly better, flash-free screen don't make quite enough of a difference to justify a blanket recommendation. Follow your heart. And if it leads you to the Nook GlowLight, you won't regret it.